Skylab 2, 3 and 4 for the manned visits, which were lofted to space by Saturn 1B rockets. That seemed simple enough, but mischief was not long in coming. We began receiving flight procedures documents (checklists and other training materials) labeled SLM-1, SLM-2 and SLM-3 (Skylab manned 1, 2 and 3). Other documents were labeled SL-2, SL-3 and SL-4, conforming to the official mission designations. It became a confusing mess because we began receiving mail and other documents clearly meant for one of the other crews and the people in the Astronaut Office mailroom became as bewildered, confused and uncertain as the rest of us. 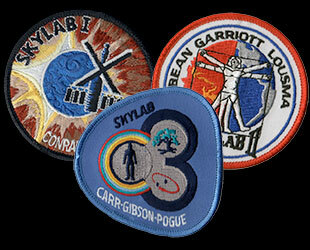 In the meantime we had designed our mission patches incorporating the official numeric designations Skylab 2, 3, and 4. During a visit by the Director of the Skylab Program, Skylab 2 commander Pete Conrad asked him, "Are we 1, 2 and 3 or are we 2, 3 and 4"? He replied, "you are 1, 2 and 3". All of us went back to work and designed new patches to incorporate the numerals 1, 2 and 3. Skylab 1 and 2 used Roman numerals and Jerry Carr, Ed Gibson and I used the Arabic numeral 3. The designs were rendered by artists and sent to Headquarters for approval. The whole process took several months, and the artwork didn't arrive in Washington until about six months before the planned launch of the Skylab. The Associate Administrator for Manned Space Flight took one look at the artwork and disapproved the design because he said the official flight designations, "2, 3 and 4" were to be used. Thus informed, we dug out our original designs (for 2, 3 and 4) and were in the process of getting the artwork done when informed by Headquarters "not to bother". We could use the designs for 1, 2 and 3. Then we found out why. The people who had manufactured the Skylab flight clothing (to be worn onboard) had already completed their work several weeks earlier in order to get the clothes packaged and shipped to the Cape to meet their deadline (for stowage onboard Skylab, which was already in pre- launch processing). Furthermore, they had already used the designs submitted earlier for the mission patches. They didn't have time to wait for official approval. The designs using the numeric designation 1, 2 and 3 became approved by default because items with these patches were already stowed in the Skylab lockers at the Cape. Removing them for patch change-out was considered too expensive and disruptive of launch preparations. So, although officially designated as Skylab 2, 3 and 4, the mission insignias bear the numeric designations as follows: Skylab 2 (Roman numeral I), Skylab 3 (Roman numeral II) and Skylab 4 (Arabic numeral 3). When traveling in Afghanistan in 1975, I presented some VIPs with our Skylab 4 patch. One lady looked thoroughly confused and asked about the numeral 3 on the Skylab 4 patch. I gave her this long-winded explanation and, by the time I finished, they were roaring with laughter. This has to be the most exasperating bit of space trivia ever. It's especially confusing to autograph collectors who still scratch their heads trying to sort out their trophies. From the Mercury program through the Apollo lunar missions, astronauts were permitted to name their own spacecraft in an "off again - on again" policy. The practice of allowing crews to name their spacecraft was formally discontinued starting with the Skylab missions. Although the shuttles are given names, their designations were selected by NASA officials, not by the astronauts, e.g. Enterprise, Columbia, Challenger, Discovery, Atlantis and Endeavour. Program names such as Mercury, Gemini, Apollo, Skylab, Apollo-Soyuz, Space Shuttle, Space Station Freedom and International Space Station were all decided at high level, albeit, sometimes after a NASA contest. Sometimes the spacecraft-naming process became controversial and resulted in battles of will between the flight crews and self-appointed screening experts at NASA Headquarters. Astronaut Gus Grissom almost ran afoul of the approval loop but won out in the end. His choice, Molly Brown, was eventually approved. However, the NASA bureaucrats were so "ticked off" after the Grissom incident, that no names were allowed for the remaining Gemini flights (4 through 12) and Apollo flights 7 and 8, merely the official numerical designations were used, e.g. Gemini 4, 5 etc., and Apollo 7 and 8. Virgil I. 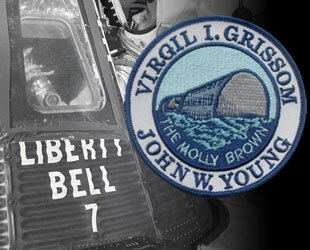 "Gus" Grissom flew the second Mercury suborbital flight in a spacecraft he named Liberty Bell 7. After landing in the Atlantic the hatch inexplicably blew off and the spacecraft began taking on water. Gus climbed out, got into the water and started having a problem of his own. His suit began filling with water and the chopper pilot diverted from trying to recover the spacecraft to work on saving Gus. In so doing the spacecraft sank. Gus was chagrined at the entire turn of events. Later, Gus was assigned as commander of the first Gemini mission, Gemini 3, and coined a suitable name for the spacecraft he and John Young would fly. The name Molly Brown was his choice from the stage show, "The Unsinkable Molly Brown". It seemed entirely appropriate and innocent enough but someone at NASA thought the name was a bit frivolous so they ordered him to submit another name. "Okay," he said, "I'll call it the Titanic". Gus got his way, Molly Brown was approved. After that none of the other Gemini crews were permitted to name their spacecraft and simply used their mission designations (Gemini 4 through Gemini 12). Starting with Apollo 9, astronauts were once again permitted to name their spacecraft but the practice ended with Apollo 17. Beginning with Apollo 9, two spacecraft were flown for each Apollo mission and the crews were once again permitted to name them both. The Command and Service Module accommodated all three crewmembers and the Lunar Module only had space for two (the crew who were trained to land on the Moon). Earlier in the program, the designation Lunar Excursion Module, or LEM, was used but it was shortened to LM. The word, "excursion" seemed to suggest a holiday outing rather than the deadly serious business of landing on an extraterrestrial surface. However the acronym LM was still pronounced: "lem". The commander (CDR) and lunar module pilot (LMP) would land on the Moon. The command module pilot (CMP), who would stay orbiting the Moon while his two crewmates landed, was given the privilege of naming the CSM. The CDR and LMP hashed out a name for the LM. It should be noted that during radio transmissions with Mission Control, the mission designation was used as a call sign, for example, "Apollo 9, this is Houston." The following are the crew-selected spacecraft names in the order they were flown. Gemini 4, 5, 6, 7, 8, 9, 10, 11 and 12 spacecraft were not named; Apollo 7 and 8 spacecraft were not named. The Apollo crew titles are given in the following order: CDR (Commander), CMP (Command Module Pilot), LMP (Lunar Module Pilot). Skylab 1: Launch of the Skylab space station by a Saturn V.
Skylabs 2, 3 and 4 launched by Saturn 1B rockets for manned visits to Skylab. The last launch of an Apollo-type spacecraft was the Apollo-Soyuz joint mission in 1975. The shuttle orbiters were given engineering designations in addition to being given names. The names were selected by NASA Headquarters (except for the Enterprise) with the following explanations regarding their names. OV-101 Enterprise Named after the fictional starship of the Startrek television series. The Enterprise never flew in space. OV-102 Columbia Named for a U.S. Navy sailing frigate that circumnavigated the globe circa 1840. OV-099 Challenger Named for a U.S. Navy ship that made a prolonged exploration of the oceans (1872-76). OV-103 Discovery Named for two ships: British explorer Henry Hudson's ship (1610-11) used in an attempt to find a northwest passage from the Atlantic to the Pacific (through what is now Canada) and also after one of British Captain James Cook's ships used in exploring the Pacific ocean. OV-104 Atlantis Named after a two-masted ketch operated for the Woods Hole Oceanographic Institute from 1930 to 1966, which traveled more than half a million miles doing ocean research. OV-105 Endeavour Also named after one of the ships commanded by Captain James Cook during exploration of the Pacific ocean. William "Bill" Pogue orbited the Earth for 84 days during the final manned flight aboard the Skylab space station in 1973 and 1974.